Have you heard of incus clouds? The term itself may sound unfamiliar, but its appearance in the sky is not. In fact, it is quite a common sight and the weather system it brings is not uncommon. Read further to learn more. Incus clouds are cloud formations that have an anvil-shaped summit. The incus cloud is an accessory cloud that forms on the upper part of a cumulonimbus cloud. Incus is a Latin word which means anvil and it aptly describes the shape of the cloud formation on top of the cumulonimbus cloud since it stretches horizontally like a blacksmith’s anvil. This cloud type is commonly associated with very bad weather condition. The incus cloud is classified under the cumulonimbus clouds genera. It is a thunderstorm-producing cloud which is also popularly referred to as cumulonimbus incus. This cloud formation brings several dangerous elements like strong wind, heavy rain, lightning and hail. The cumulonimbus incus is a well-developed and powerful cumulonimbus cloud that may grow into a supercell thunderstorm which spawns severe storm and tornadoes in just a short period of time. Since this cloud is found on top of a cumulonimbus cloud, it can be found at higher atmospheric elevations, from 35,000 feet to 60,000 feet above the ground. The emergence of incus clouds in the atmosphere is a cause of concern for aircraft operators due to the very strong currents of air involved during its formation as well as the damaging effects of huge hailstones it produces. It is therefore wise to stay away from this cloud formation to ensure aircraft and passenger safety. The incus cloud comes into being due to very strong thunderstorm updraft (rising warm air) which is a result of atmospheric instability and powerful convection. The cloud continues to grow and expand if the surrounding air of the thunderstorm updraft remains unstable. 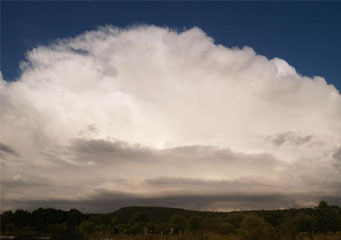 However, when the surrounding air is warmer than the thunderstorm updraft, the cloud can no longer rise; it instead spreads out forming an anvil-shaped cloud. This happens when the cloud has reached the base of the stratosphere which is warmer than the rising updraft. An incus cloud closely resembles a blacksmith’s anvil, appearing as a wedge-shaped heap of cloud on top of a gigantic cumulonimbus cloud which is often called a thunderhead. And because incus clouds are found on the summit of cumulonimbus clouds where air temperature is below freezing point, they are largely made up of ice crystals, thus explaining the cirrus appearance. However, strong, high level winds may propel the ice crystals thereby lending the incus clouds their streaky form. How common are Incus Clouds? This cloud formation is common worldwide especially in the tropics and sub-temperate regions. On the other hand, it is not known to occur in the polar regions. So the next time you see incus clouds developing on top of cumulonimbus clouds, you know that it’s a sign of mature thunderstorm and bad weather is fast approaching.